DJ Nicoline, originally uploaded by metz79. A wonderful photo from the Copenhagen nightlife, taken by fellow Copenhagen Flickrite Metz79 - a super cool photographer and all round groovy person. The photo is titled titled 'DJ Nicoline'. The sticker on the bike says, "It's only love, give it away." We've seen them around before and love the slogan. 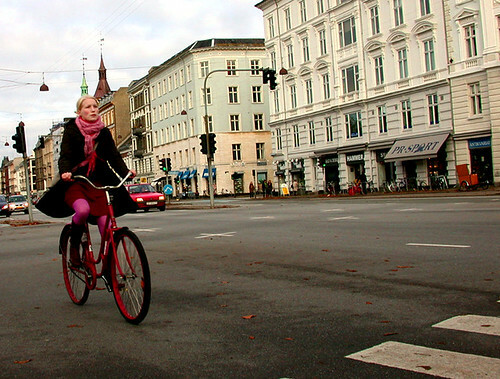 And here's another photo we found on Flickr, taken in our own 'hood. happy holidays to all, to not only the hosts of this wonderful blog [which gifts me every day!] but also to its many and fine readers who also help make it possible. my wishes for the holidays? and that peace shall soon wash over the planet. thanks for that lovely message, mostlyreverend. best wishes for the holidays and the new year to you, too. Too bad she's posing with a Cash n Carry bike - totally unchic, worthless, rust-in-no-time P.O.S. could you send me one of those stickers? unfortunately, i don't have any of those stickers.